Inc. Magazine Says Don’t Miss The (Ferry) Boat! According to the June 2010 issue of Inc. Magazine, it’s a good time to launch a ferry, boat business. Ferryboat Industry Gaining Speed | Best Industries for Starting a Business 2010 Well, not surprisingly, the author does admit it’s an eyebrowraiser. The industry as a whole is poised to experience a significant amount of growth in coming years. According to AnythingResearch.com, inland water passenger transportation is a $440 million industry, which has grown an average of 12 percent a year since 2004. Who is actually benefitting from this growth? The majority of water transportation in this country is run by public agencies, but we tracked down several private ferry companies that have managed to profit handily. Despite water transit’s being a capital- and labor-intensive business, there’s no doubt it provides an increasingly pleasant relief from congested freeways and mundane subway commutes. There’s also the fun factor – running a fleet of boats sounds pretty exhilarating. They identify 5 trends to follow: 1.) Public Subsidies; 2.) Think Multipurpose; 3.) Green New Machines; 4.) Catering to Local Tourists and Staycationers and 5.) Think Global. Interested in keeping others from but getting your own feet wet in the ferry business, read the entire article. 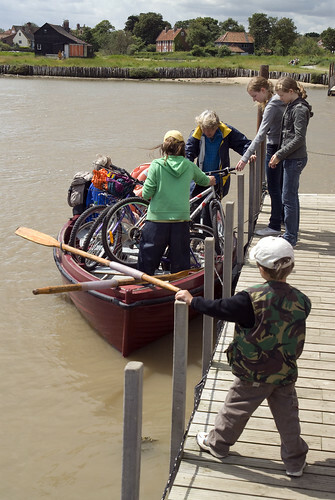 Of course, you can never be too young to start working for a ferry service. The above photo is of my then 6 year old son Luke, handling the lines of the Walberswick – Southwold Ferry in Suffolk, England. The ultimate “green” maritime operation which also benefited from a low capital investment. It can be backbreaking work though. Posted on June 13, 2010 Author Peter A. MelloCategories maritime, workTags ferry, Inc.com, Southwold, WalberswickLeave a comment on Inc. Magazine Says Don’t Miss The (Ferry) Boat!